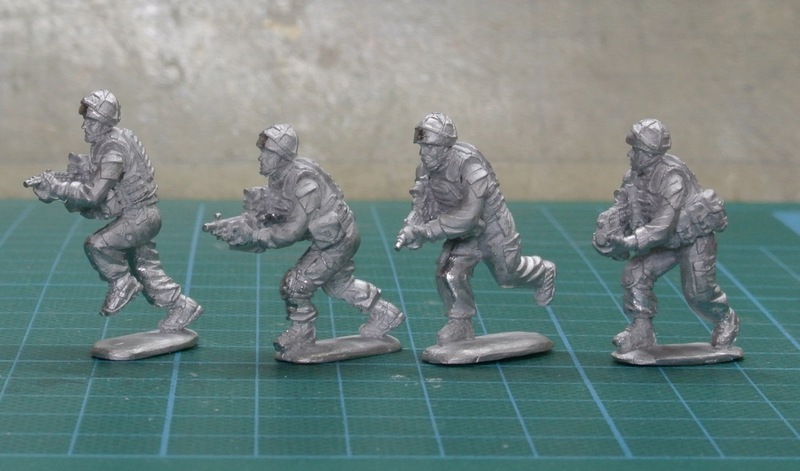 Four new weapons teams are coming soon from Eureka Miniatures. 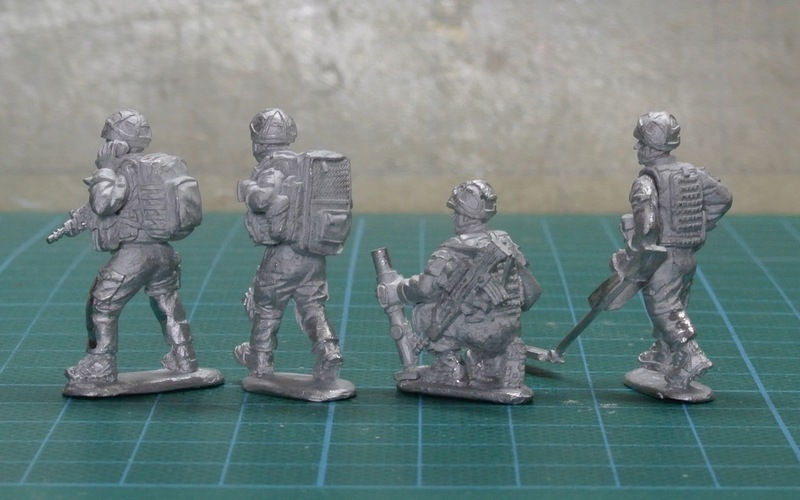 These join the 1980's Soviet troops shown here and here, which are already available here at the Eureka web store, or here at Eureka Miniatures USA. 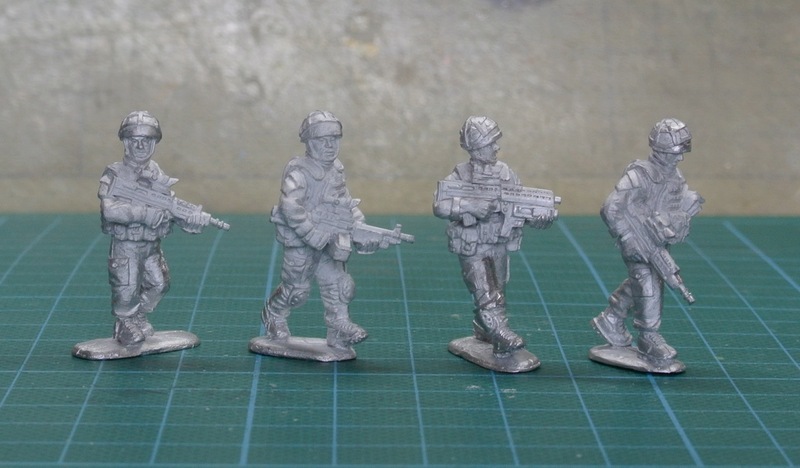 They are designed for wargaming Soviet-Afghan War and 'what-if' Cold War scenarios. 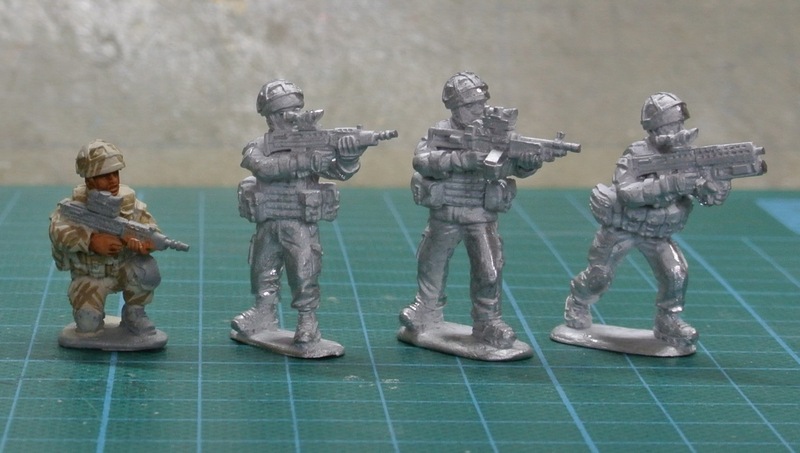 As the sculptor and designer of these figures, I first needed to decide the overall look that I was going to go for with the uniforms. 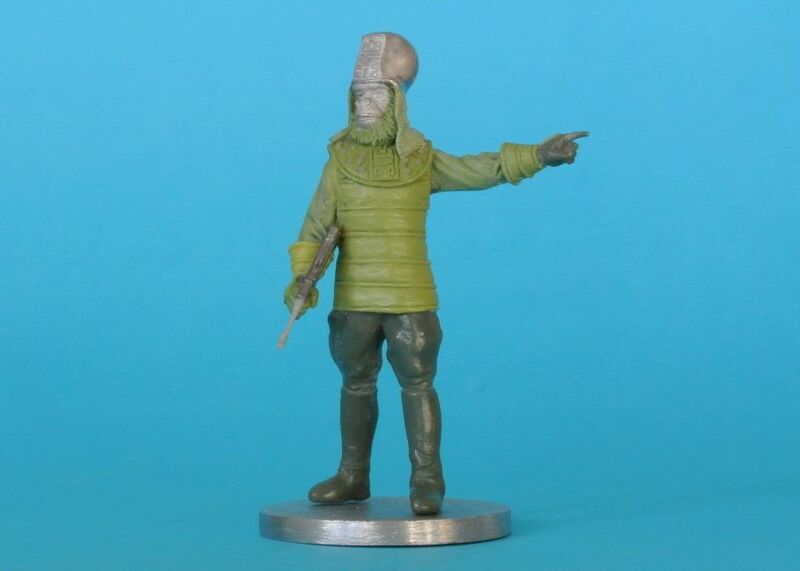 Soviet soldiers deployed to Afghanistan during the 1980's wore a wide range of uniforms, which also changed along the duration of the war. 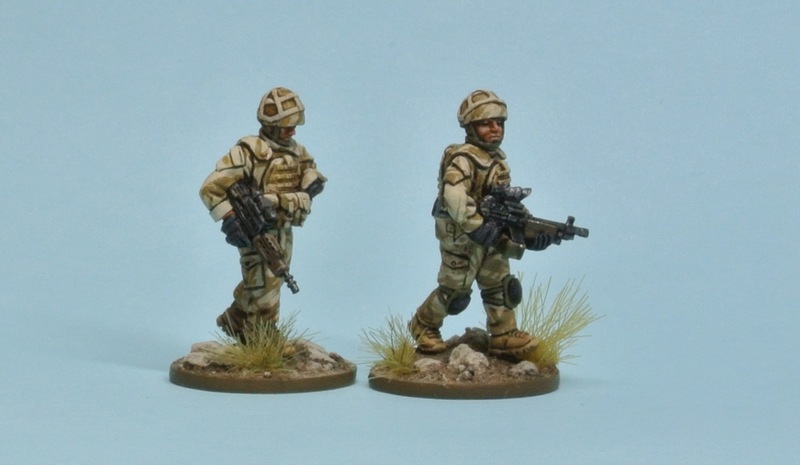 In the end, I decided to match the infantry sets that I'd already made, which is primarily a KLMK camouflage suit, over which is worn the 6B-2 flak jacket. Some figures' flak jackets are variants with integral pouches and pockets for AK magazines or grenades, others wear chest-rigs or webbing. 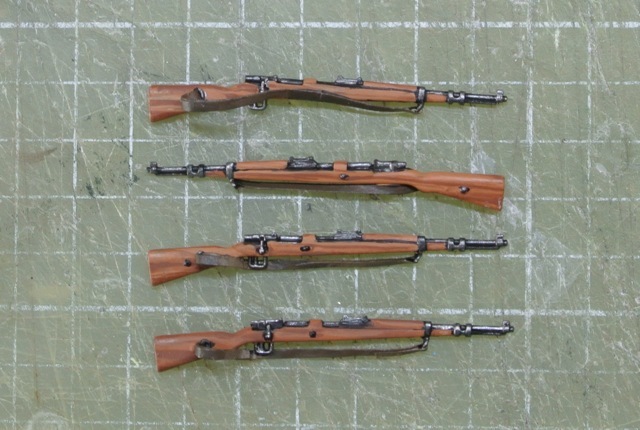 The Soviet engineers in the below photo are an excellent study of this combination. 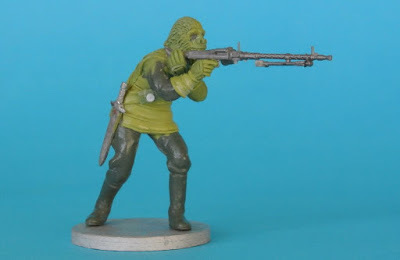 First is an SPG-9 Recoilless Rifle with three-man crew. 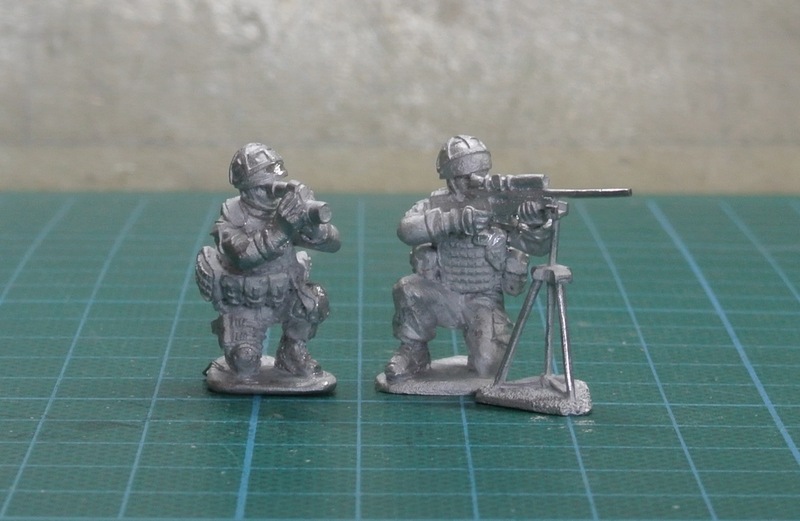 Next is a standard 82mm Mortar with two-man crew. 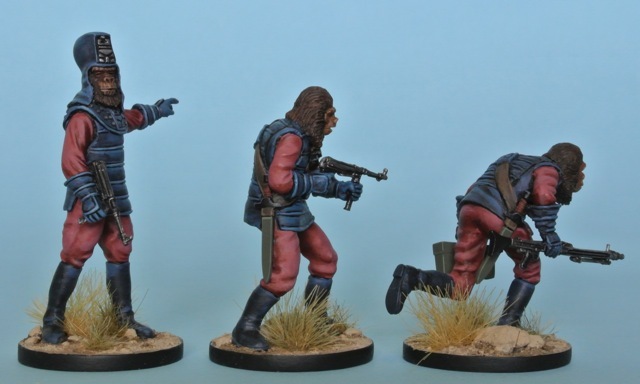 AGS-17 Automatic Grenade Launcher with two-man crew. 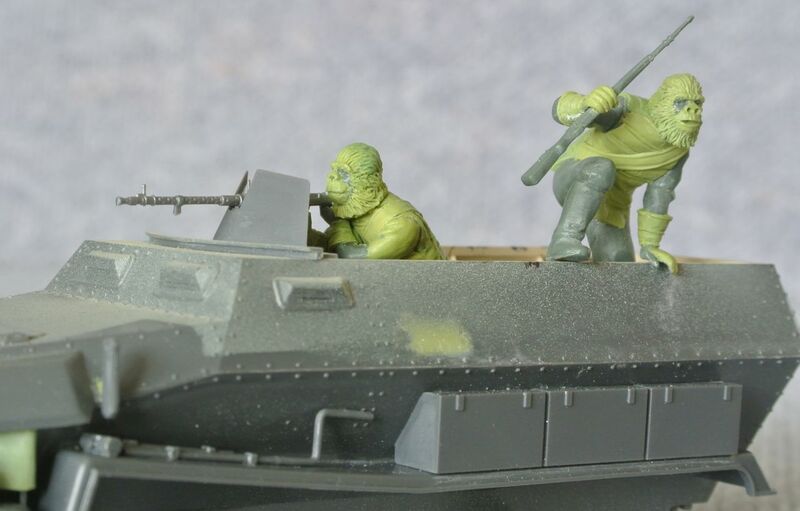 And lastly is the NSV Heavy Machine-Gun with two-man crew. While the above weapons are already available with the Afghan Guerilla figure sets, this one is newly mastered. Extra NSV photos below. Scroll down for the painting guide available here. 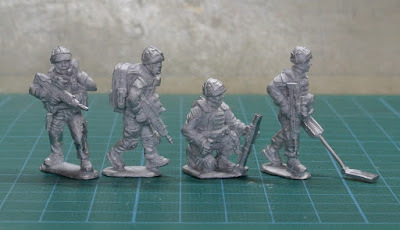 First look at the upcoming modern British infantry figures from Eureka Miniatures. 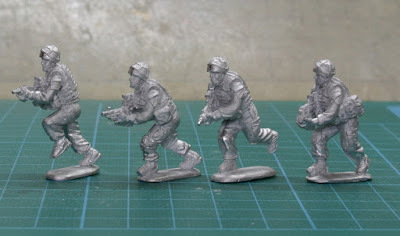 I sculpted the figures themselves a while ago, and got some paint on five examples for these photos. 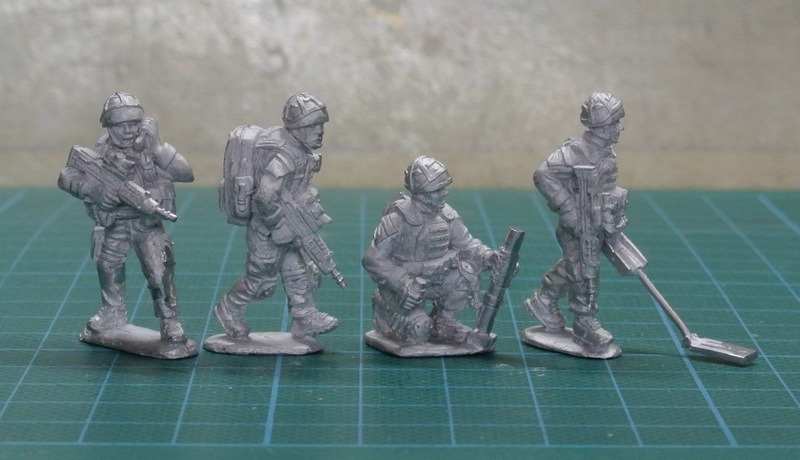 I believe that the production moulds have been made, so they should appear in the eureka miniatures web store soon. 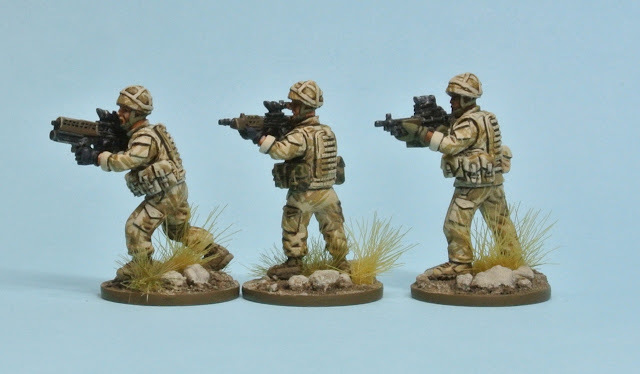 These figures represent British troops as they appeared between 2006 and 2010, during their deployment to Helmand province in Afghanistan as part of ISAF (International Security Assistance Force). As such, the figures are depicted wearing Mk6A helmets and Osprey Mk2 plate-carriers, rather than the newer Mk7A helmet and Osprey Mk4 body armour. Fabric areas are painted in desert DPM as opposed to the more current MTP camouflage scheme. 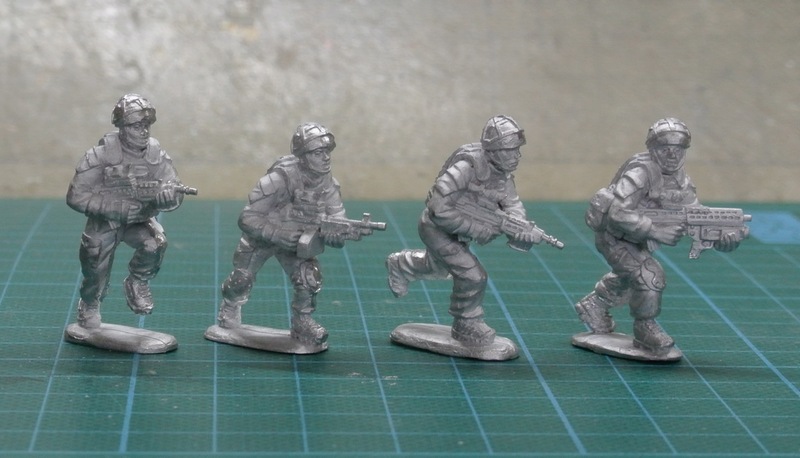 Here's a sneaky look at each set in the range. 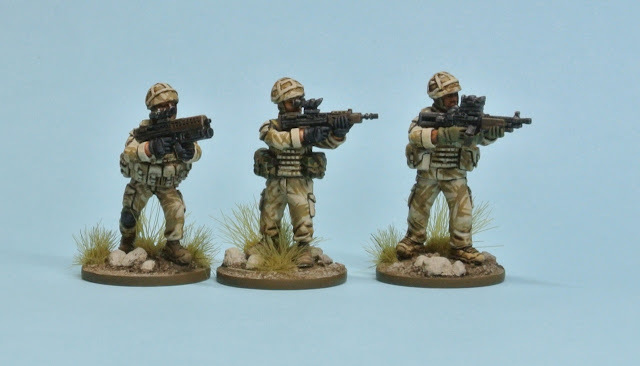 Apologies for not running a black wash over the figures. I was very fortunate to have the assistance of author Leigh Neville when I was preparing this range. 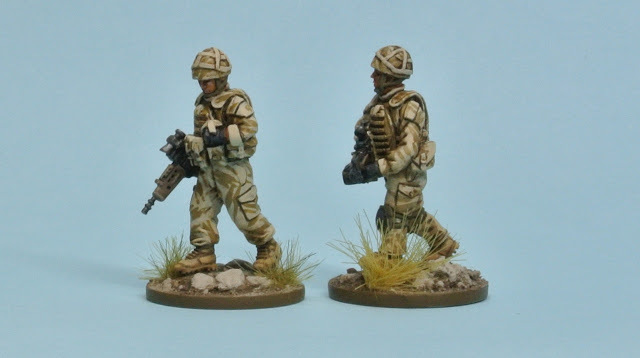 Leigh's knowledge was a great help when I was ironing out some of the more stubborn details, and also helping me figure out when different bits of kit were being issued. For anyone seeking a good primer on this subject I can recommend the Osprey book that Leigh authored, with illustrations by Peter Dennis. 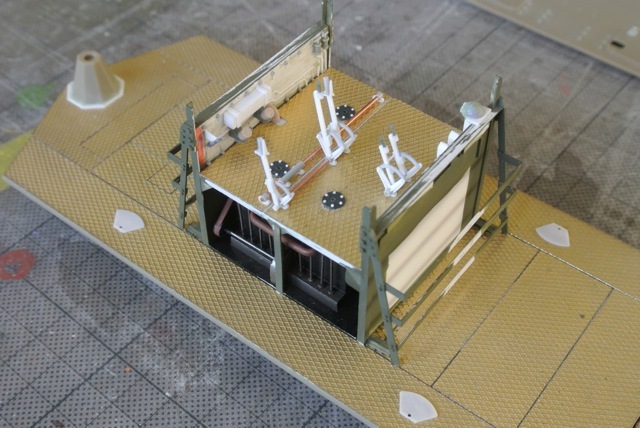 While the previous post concerned a modelling project requiring tons of research and rivet-counting, this one ticks all the boxes of what scale modelling can also be about. Part one is way back here, and below are the snaps, followed by some WIP shots and then a little info. 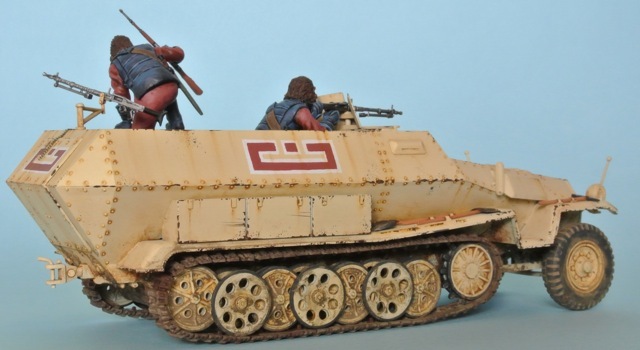 This is Tamiya's Sdkfz 251 halftrack, a kit from the early 1970's. 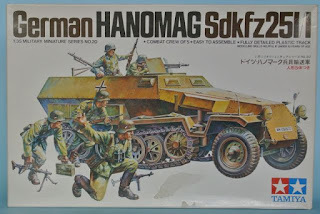 These old kits are great for practicing new paints or painting techniques on, and with a little work can build into fine models. 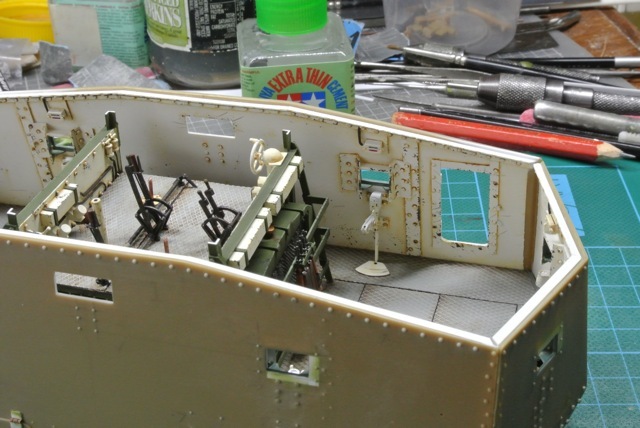 Some basic interior details were added, along with a little refinement of the headlights and width-indicators. 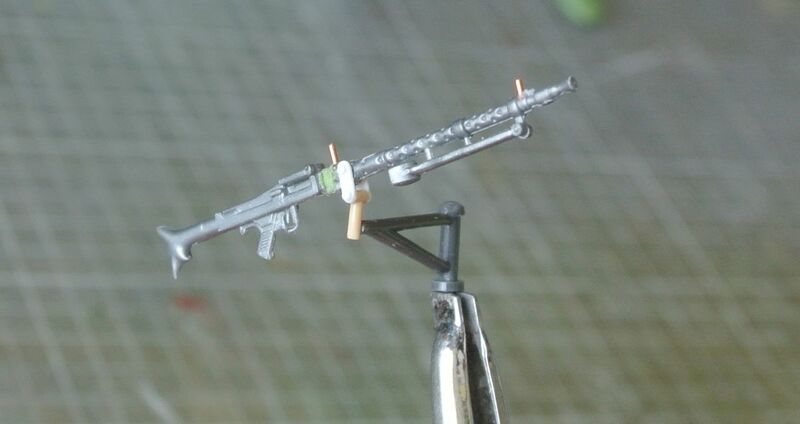 The rear machine-gun mount is pretty toy-like, so a new one was built from scratch. 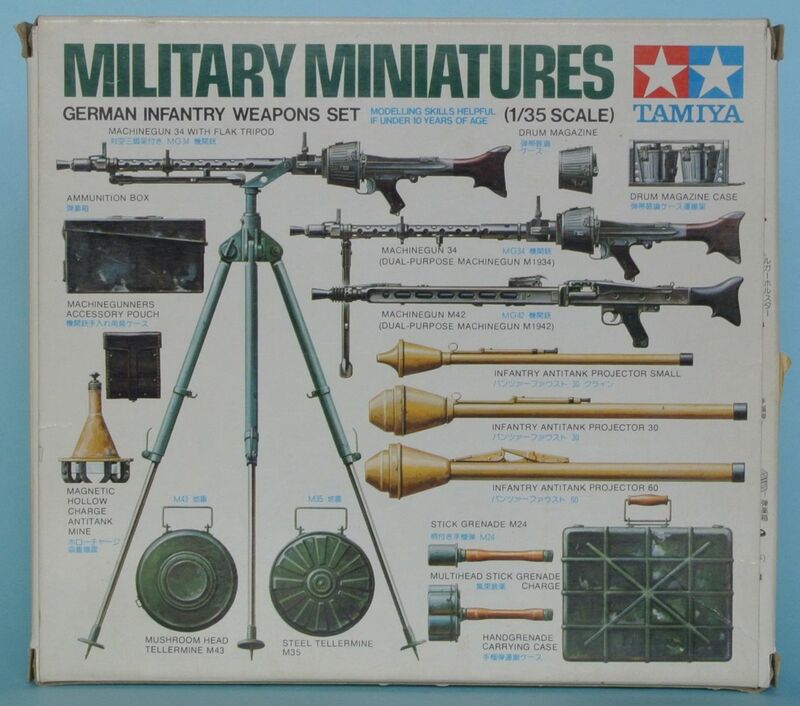 The MG's on the halftrack and most of the weapons for the figures were taken from Tamiya's old German Infantry Weapons Set. The set dates back to 1979, perfectly useful for a project like this. The figures are also vintage Tamiya, suitably converted. 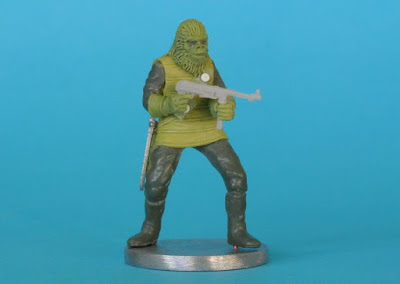 These 1970's era figures are way too basic for serious modelling, and with so many excellent figures sets now available, they'd be piled up in my cupboard without purpose. 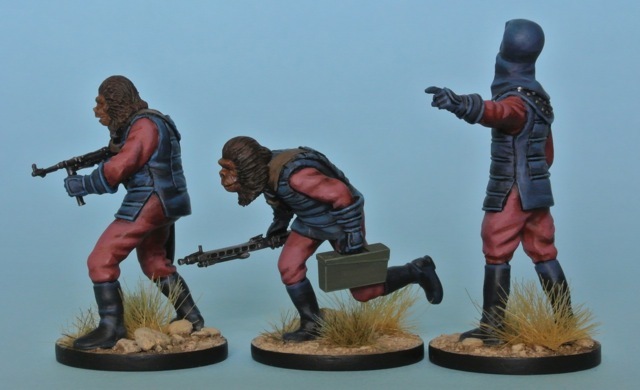 The dynamic poses are such fun, though, and so the idea of converting them to Planet of the Apes style gorilla soldiers was born. 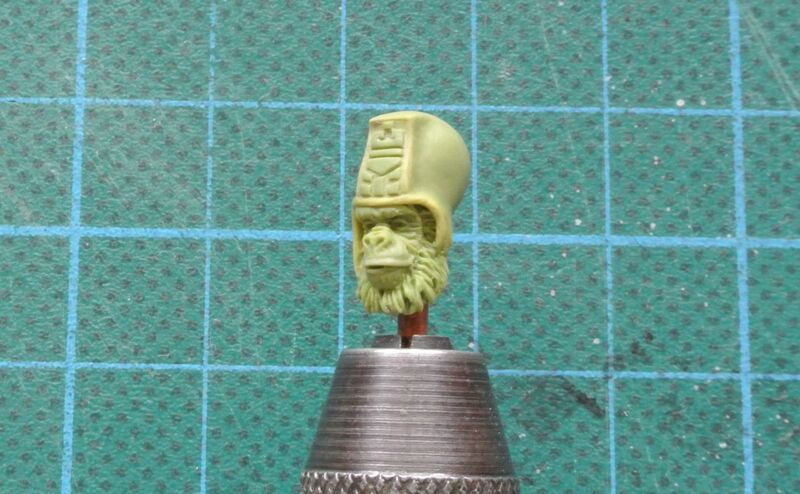 I spent a little extra time on the Gorilla General. 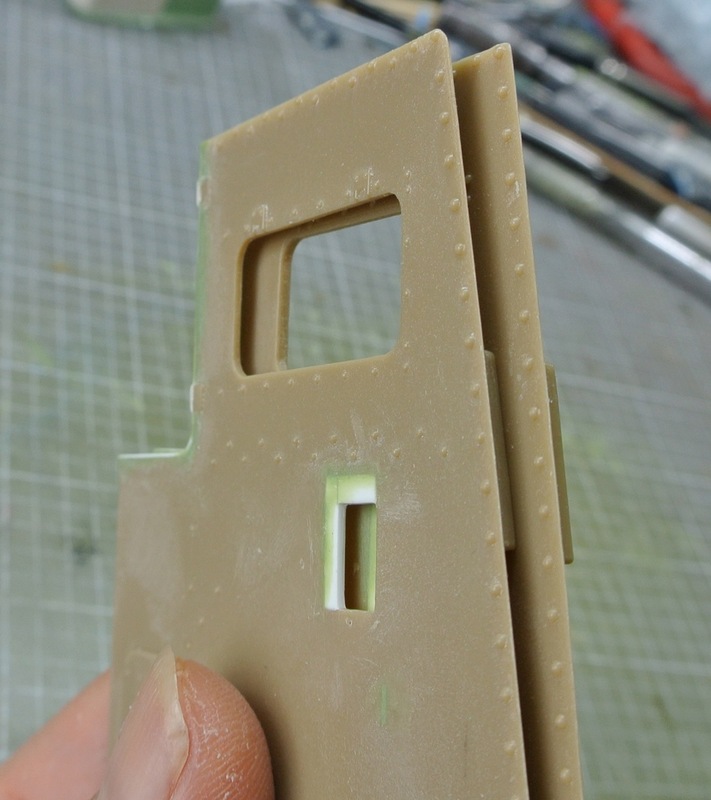 The colour is Desert Tan Base Surface Primer (73613) from Vallejo, over a rattle-can white base-coat. 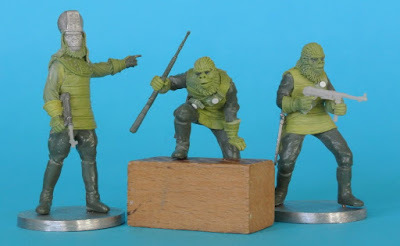 The ape glyphs were masked, then the red areas painted by hand. 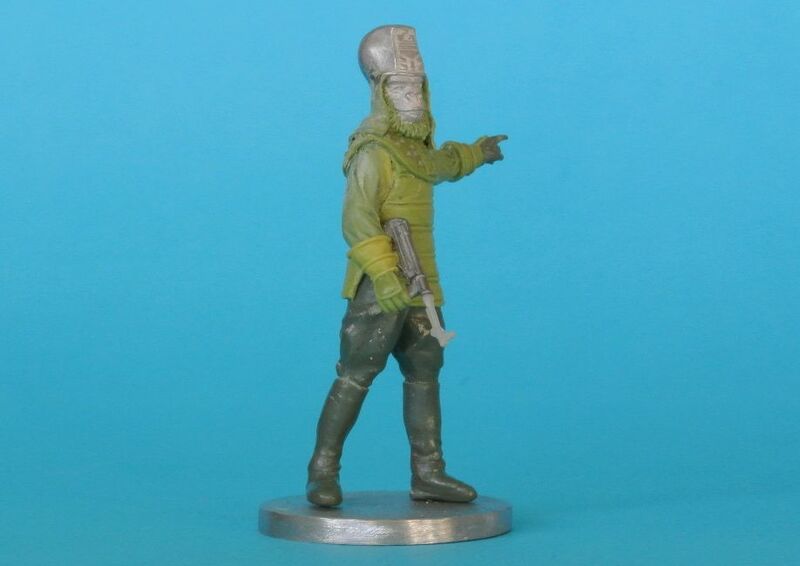 Chipping was applied with a dark grey acrylic, both with sponge and fine brush. 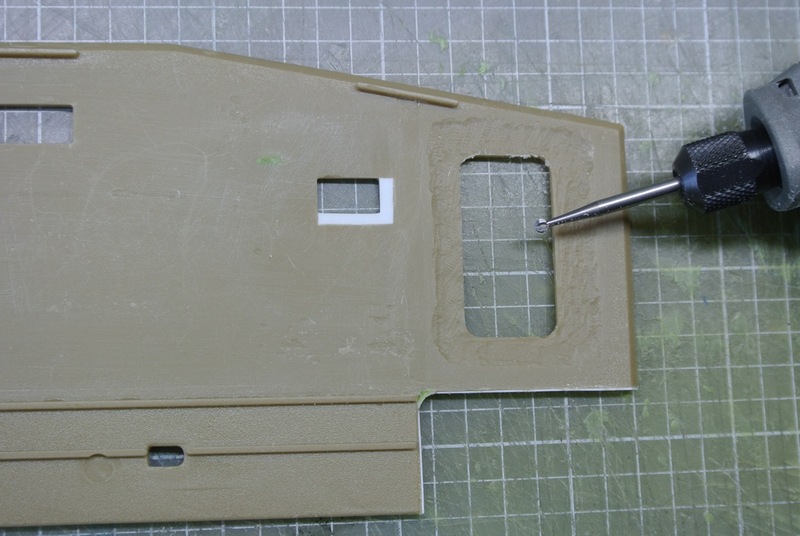 I really overdid the chipping on the interior, but I'm pretty happy with the exterior chipping. Pin washes and streaks were done with oil paints. I had never used dry pigments before, so experimented with them around the lower hull and running gear. 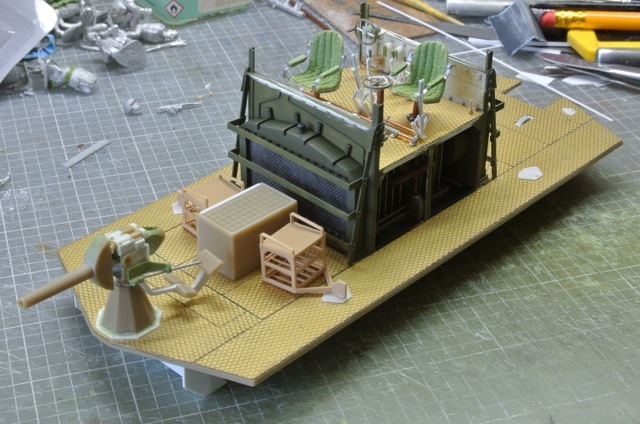 That's what this project was all about - fun, experimentation, and putting old model kits to use! 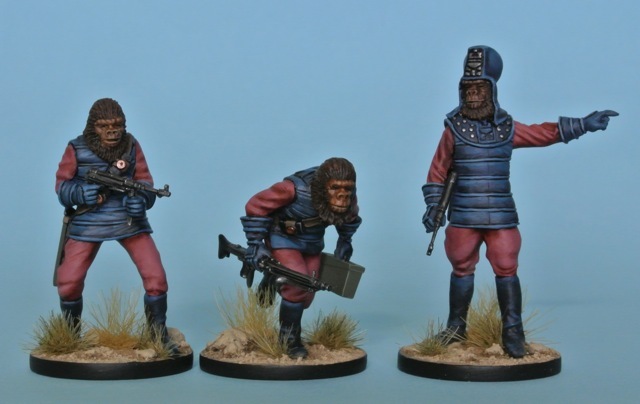 I amped-up the colours on the ape uniforms, being inspired more by the Curtis/Marvel Planet of the Apes comics than by the original five films. 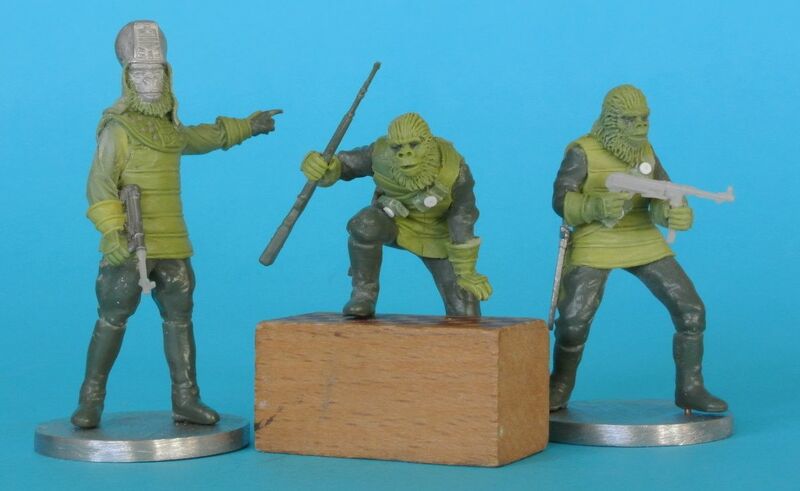 There is an excellent post here about the Newton Comics Planet of the Apes reprints, which were sold in Australia during the 1970's. These somewhat inferior reprints of the Curtis comics, with bodgie printing and stories cut off half way through, and printed out of sequence, were the ones I grew up with as a kid. 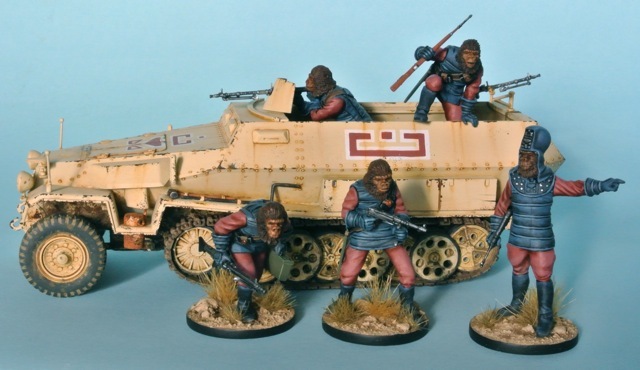 I entered the half-track (with figures) in the Sci-fi vehicles category, and the Gorilla General in the Sci-fi figures category at this years Australian Model Expo and was most pleased that they achieved a 'commended' award and second place respectively. In the Christopher Nolan film 'Inception', ideas or images implanted in dreams carry a weight that can't be ignored, shaping and influencing the future waking lives of characters. It's no stretch to say that this was the sort of impact that the first model magazine that I ever bought, the May 1981 issue of Military Modelling, had on me. On top of the striking cover artwork by the late Richard Scollins, the issue had a build review of a model tank kit from a new manufacturer that seemed weirdly exotic and very different from all the World War 2 tank models that I'd been spending my pocket money and weekends on up until then. The fact that 'Mephisto', the sole surviving A7V, wound up here in Australia also amazed me. 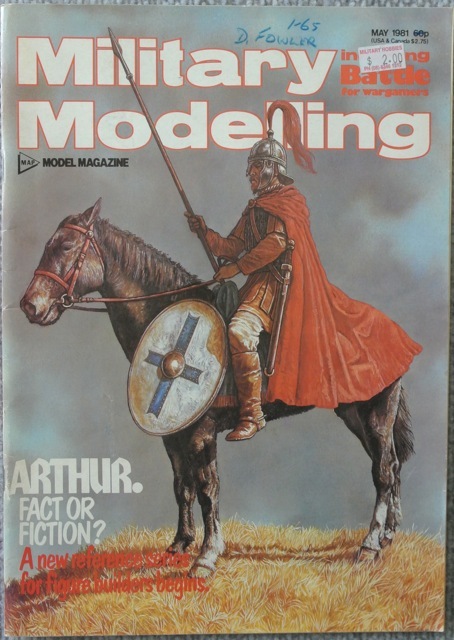 I had a standing order for Military Modelling magazine for many years from then on, and still refer to my old back issues. 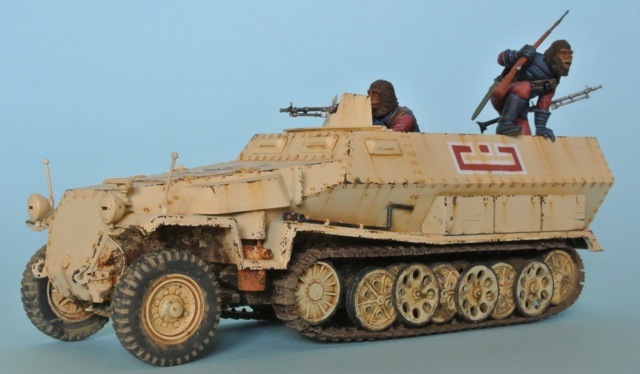 The kit was the Tauro A7V, in 1/35 scale, and in the early 1990s I got my hands on that kit, plus the Hundleby and Strasheim book, and eagerly sat down to build the model. I soon found that the Tauro model left much to be desired.... It had indy track links way before its time, but they were made from some strange vinyl material. 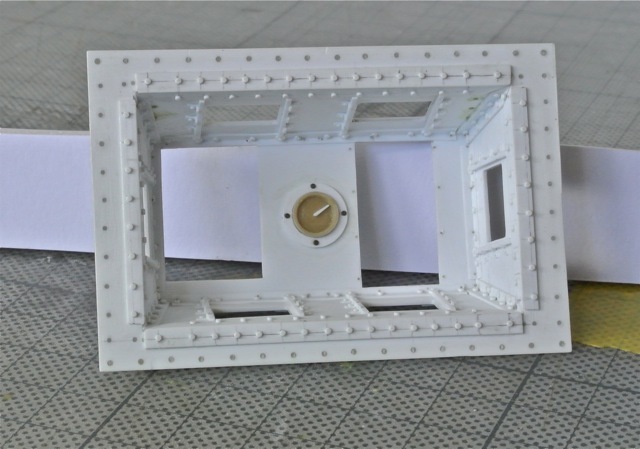 The kit had an interior, though it didn't match the one in the real tank. 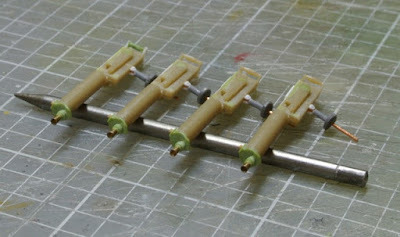 Most obviously to me, the mounts for the six MG08 machine-guns were grossly over-simplified. 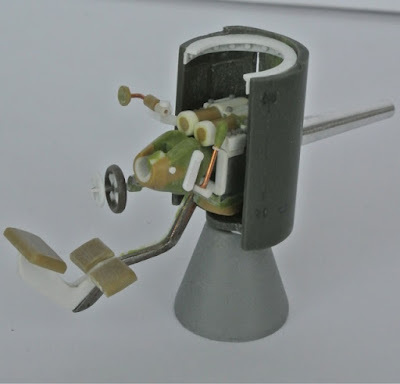 The partially assembled model went back in the box to lie dormant. Then in late 2014 I decided to have another go at the project. Sculpting wargaming figures had expanded my ability to create and animate figures, and photos of A7V tanks with their crew standing or sitting around the vehicle rekindled the idea of updating and detailing the model, as well as sculpting the crew. 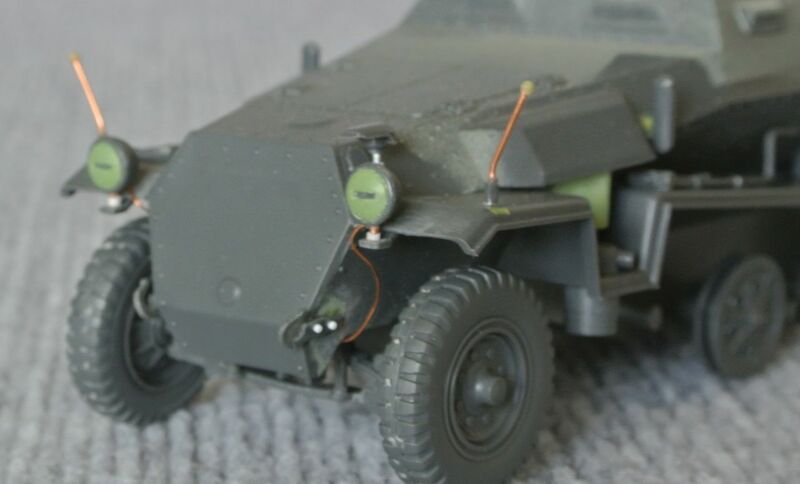 Tauro's A7V has structural inaccuracies that are difficult to fix. 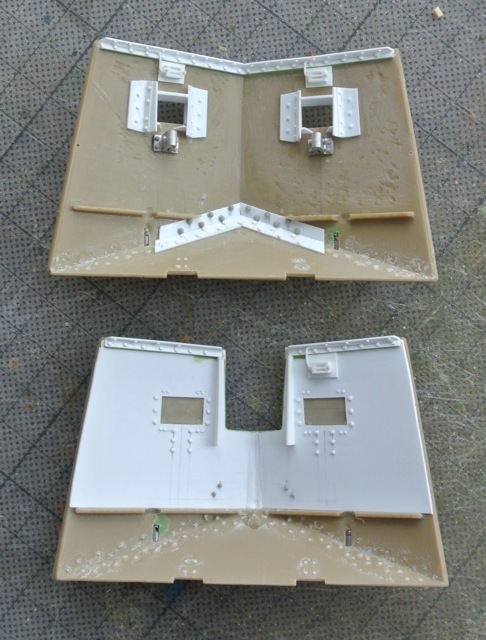 The sides of the armour plates are too steep, and so the roof area is too wide. The overall length of each bogie is too long, so to compensate Tauro have made the idler and sprocket wheels narrower in diameter than they should be. In short, I knew that I could super-detail the model, but amending all of the structural issues was going to be too much trouble. Constant checking and re-checking of photos has been the norm during construction and detailing. Each of the main phases - the interior and weapons, the exterior and running gear, and the crew figures, has challenged and stretched my modelling skills. I was well aware that soon after I started the project, the probability of a new A7V model being released was very high, especially as kits had started to appear on the centenary of the start of World War 1. The Meng A7V duly appeared, and I thought of it as a useful addition to my research material, as well as potential parts that could find their way into my model. Below are the various 1/35 plastic A7V kits, past and present. 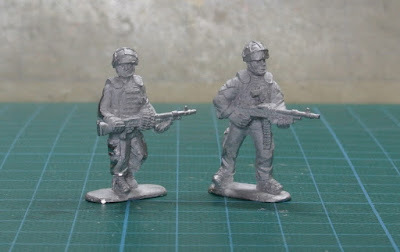 The two Tauro kits from 1981 have different box art and decals, but the plastic is the same in each kit. The Meng kits from 2015 are in the bottom row. The kit on the bottom right includes a resin engine (or more properly two engines). 'Mephisto' by Mark Whitmore includes excellent scale plans. This book is now difficult to find and it would be great if the Queensland Museum would print another edition. 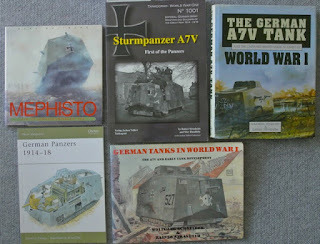 Another must have is the Tankograd 'Sturmpanzer A7V' book. 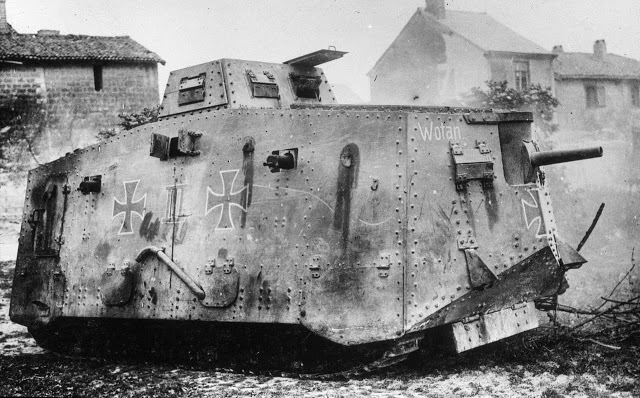 It's absolutely packed with useful photos and information about each specific A7V. The authors are Strasheim and Hundleby. The only downside is that the scale plans unfortunately contain errors. 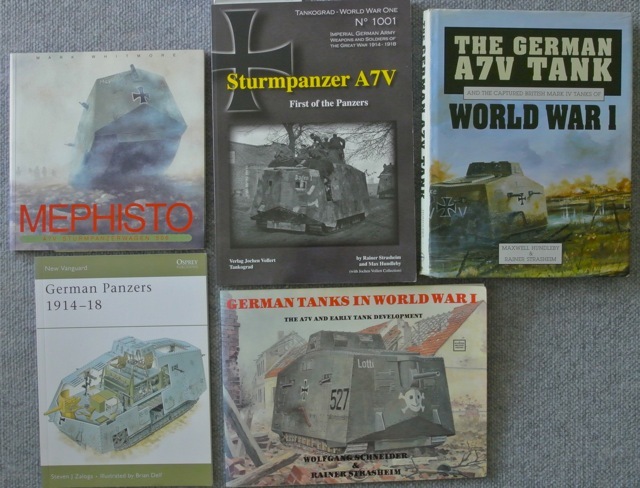 Next is Hundleby and Strasheim's 'The German A7V Tank', the cornerstone of A7V scholarship! 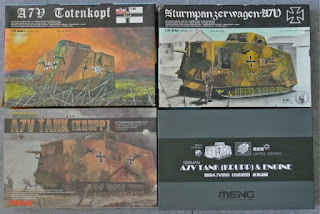 Stephen Zaloga's 'German Panzers 1914-18' from Osprey Publishing and the landscape format 'German Tanks in World War 1' from Schiffer came in very handy too. 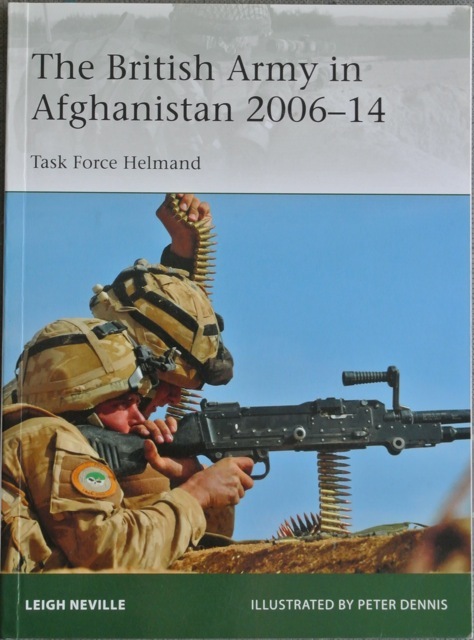 Authors of this last book are Strasheim and Schneider. 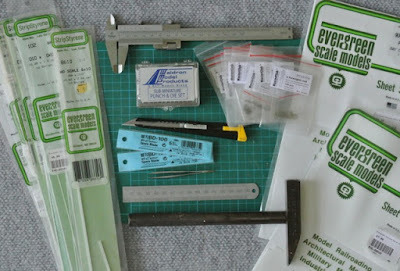 Tools and materials for this model. Styrene strip, rod, tube and sheet. 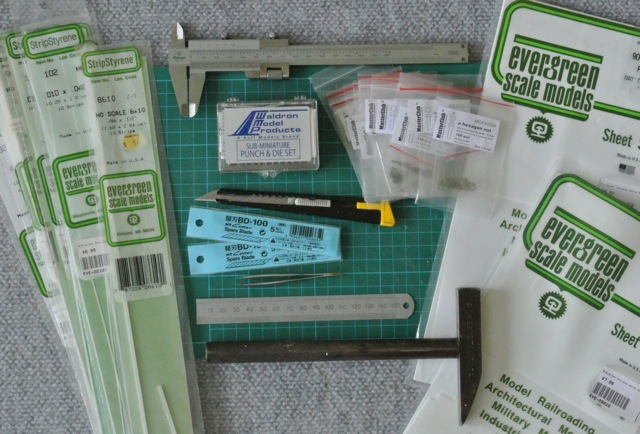 Calipers, 15cm ruler, tweezers. 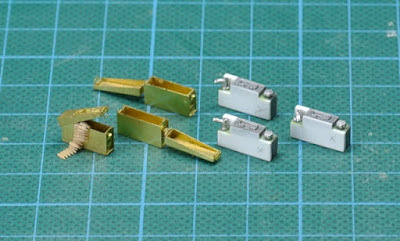 Micro Punch and Die set and hammer, the internal bolt detail was made using these. 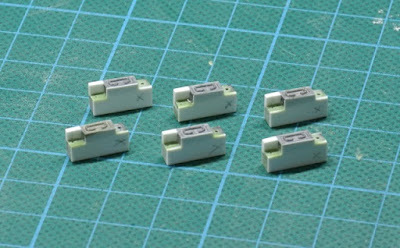 The Masterclub resin bolts are amazing, most of he external detailing was done with these. I use a snap-off blade knife, though my preferred blades have a more acute point than the usual type. I get these replacement blades from the art store. Work began with the floor. 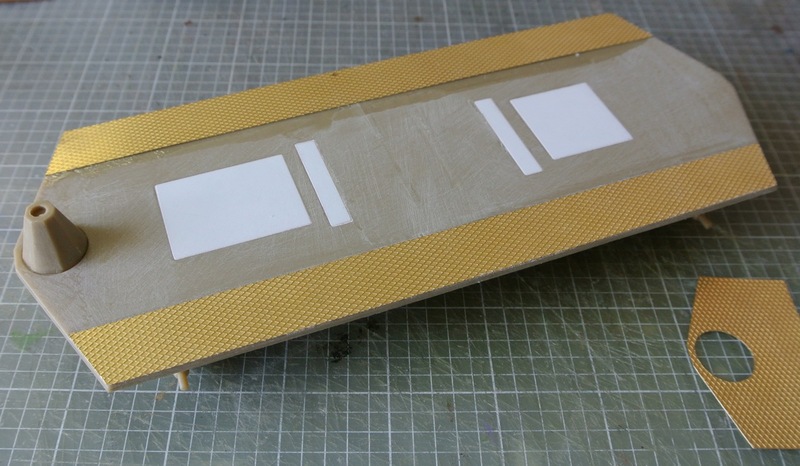 The diamond shaped tread plate is a Scale Link product. 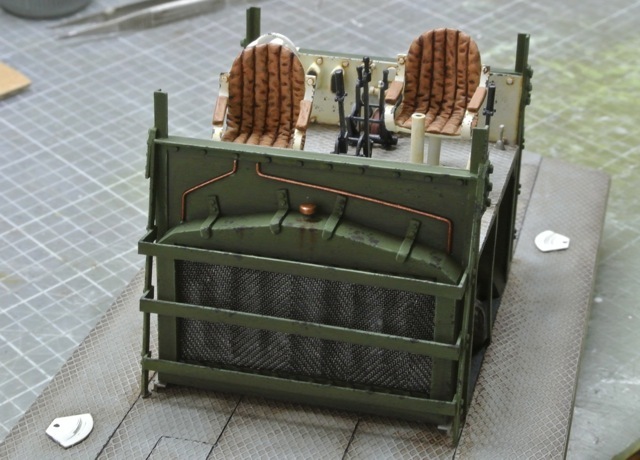 A very basic representation of the dual engine was installed under the driving compartment. Interior detailing took on a life of it's own. 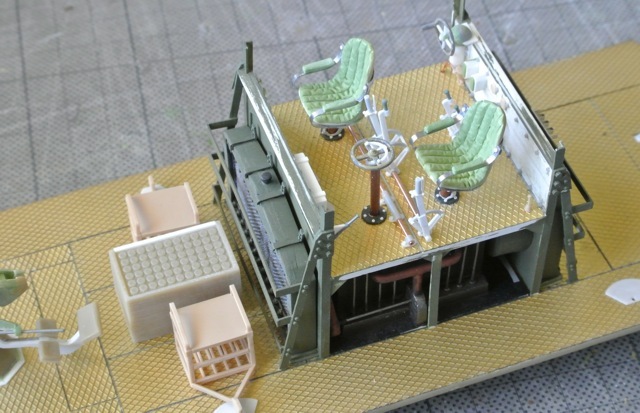 I had often wondered why modellers put so much work into interiors that would end up almost invisible, but I found myself doing that very thing. I find it hugely satisfying to research and reproduce these details. 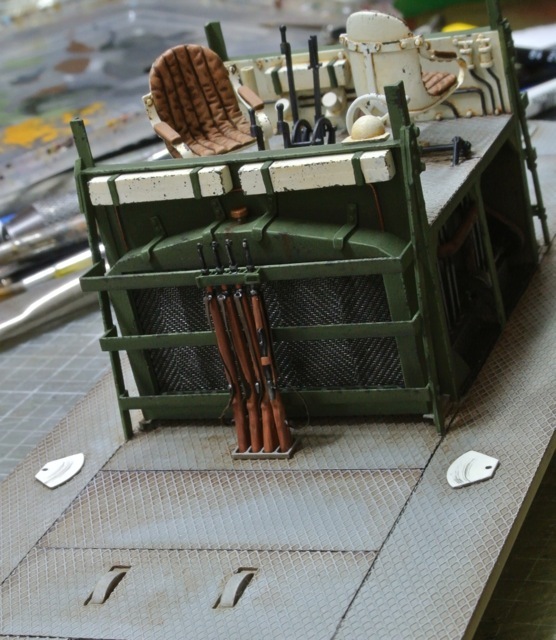 The driver and commander's seats were also built from scratch. 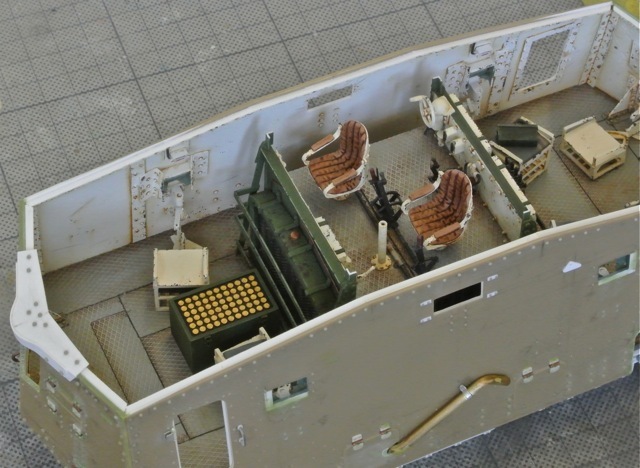 The main gun ammo bin was adapted from the kit part. 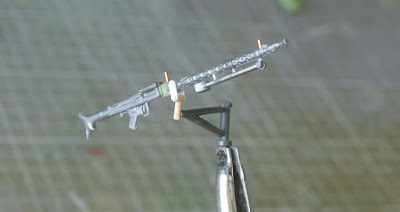 I built the 57mm gun with gunner's seat from scratch, though I ended up using the Aber barrel (designed for the Meng kit). 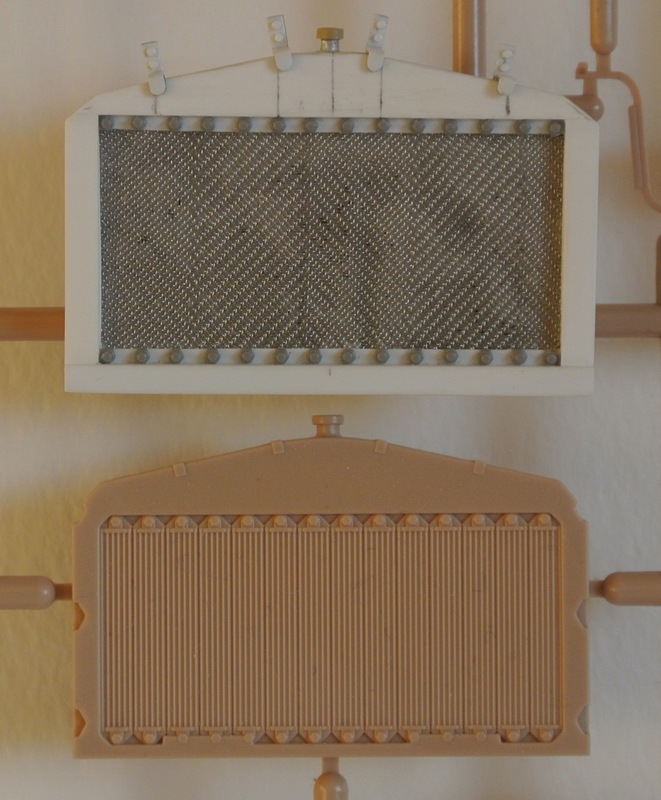 My radiator with the Meng radiator below. 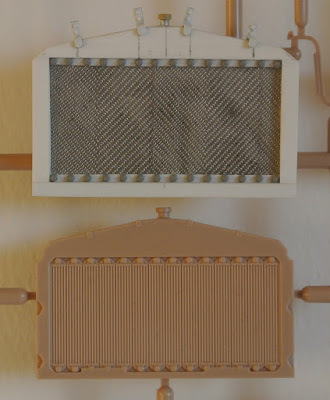 The mesh is from a broken coffee plunger. 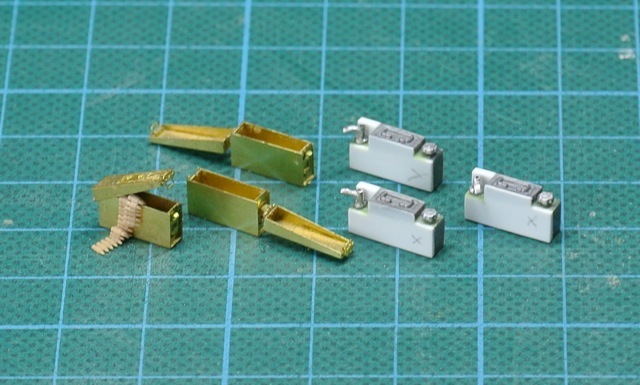 It's detailed with Meng plastic bolts. 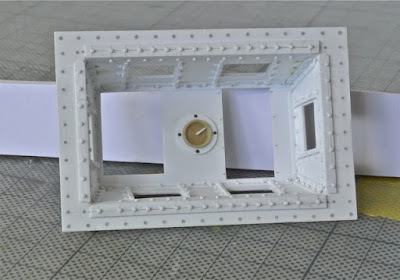 Using a round burr in a Dremel tool, I reduced the armour thickness around the doors, small hatches and machine-gun openings. The MG openings are way too big, so laminated plastic sheet was used to get them down to the correct size. 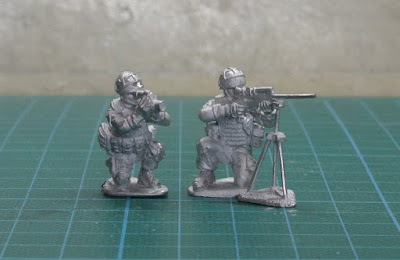 I built some of the components of the MG08 swivel mounts from scratch and had them custom cast by Eureka Miniatures. 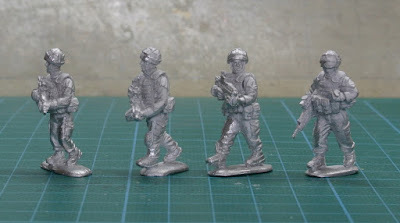 These were further detailed with plastic bolts and disks. Sheet styrene and punched-out styrene bolts detail the MG openings. 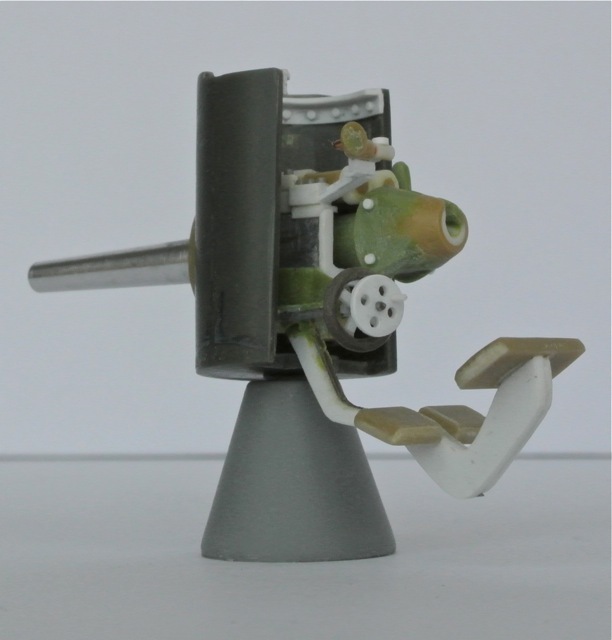 Above each position is a fire/cease fire indicator. 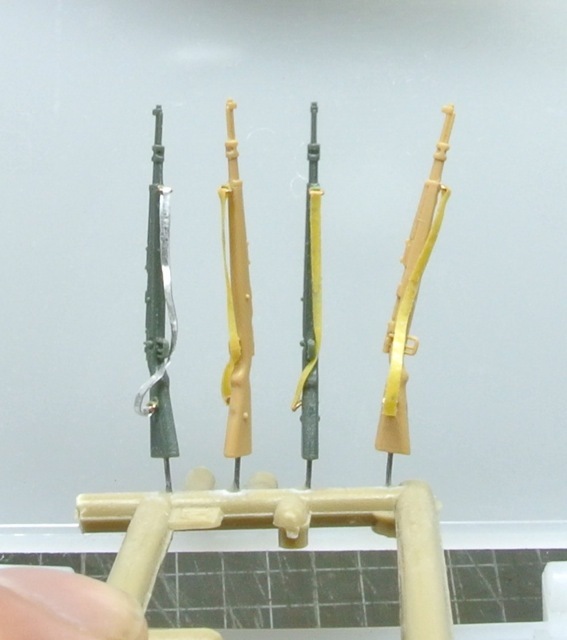 Tamiya Kar 98 rifles with slings added from thick foil (from the top of a Milo tin) or Tamiya tape. 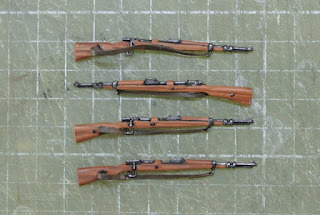 I used modified Besa MG flash hiders from RB Models to enhance the machine-guns. 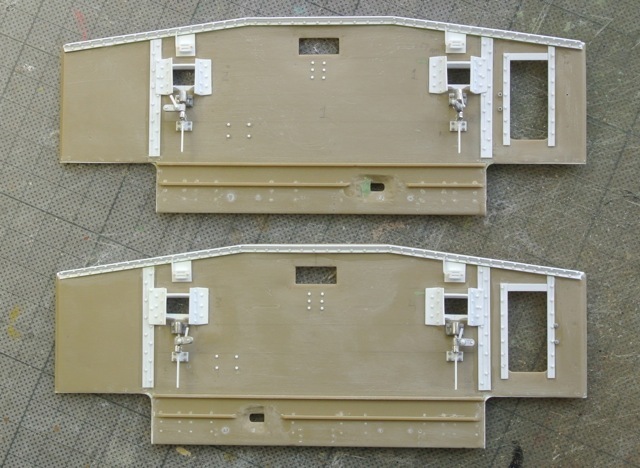 I detailed these well before the Meng kit and therefore any aftermarket parts for the A7V had been released. 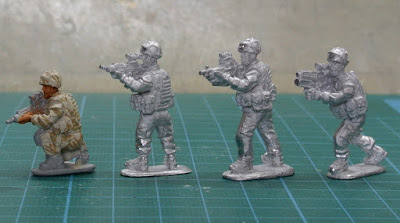 Each gun also has an asymmetrical armoured cover over the front of its water jacket, which I fashioned from my usual sculpting mix - standard yellow-grey Milliput mixed with Green Stuff. 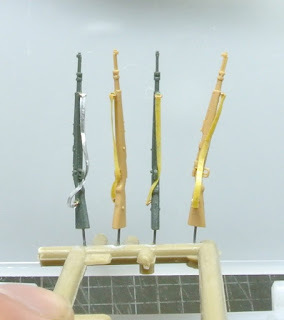 Since the late war WW1 ammo boxes used for the 7.92 MG 08 machine-guns are identical to the WW2 German ammo boxes, I was able to use these Griffon PE pieces. I don't have heaps of experience with PE, but used a PE bending tool for the fiddly job of folding them up. 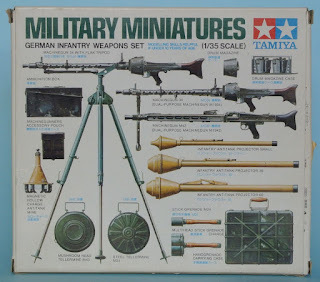 The water condensation cans are heavily altered pieces from Tamiya. 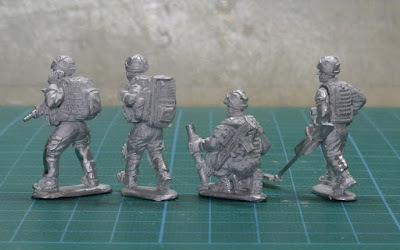 They started out as MG 34 ammo boxes. 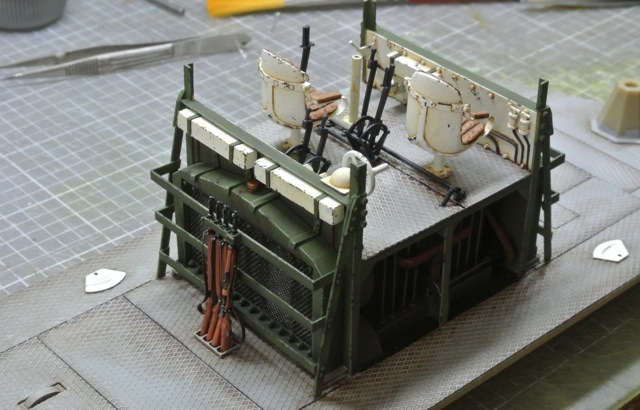 There are four tall and two short machine-gunner's seats. 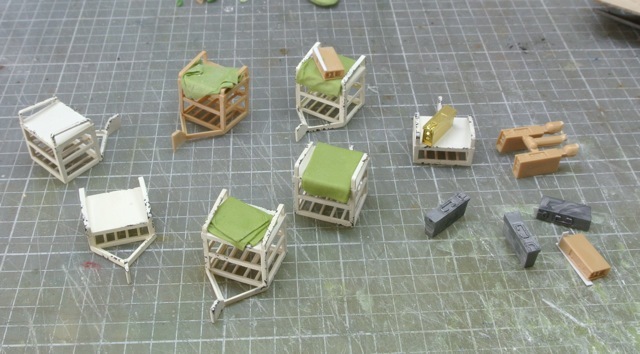 I ended up pinching most of them from Meng's kit, but left one of each unbuilt in the Meng box, in case I needed patterns to model more from; so in the end I only had to build two seats from scratch. I reasoned that instead of comfy pillows perhaps folded army blankets may have been used to make the seats more comfortable, so I made these out of my sculpting mix. 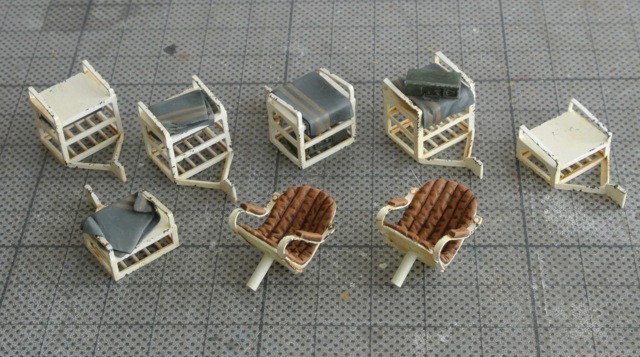 Here all the seats have been painted and lightly weathered. 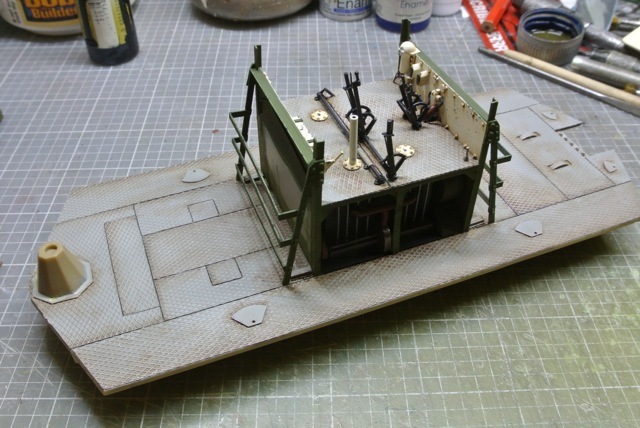 With construction and detailing of the major interior components and machine-gun fixtures done, painting could commence, leading up to attaching the four armoured sides to the chassis/floor. 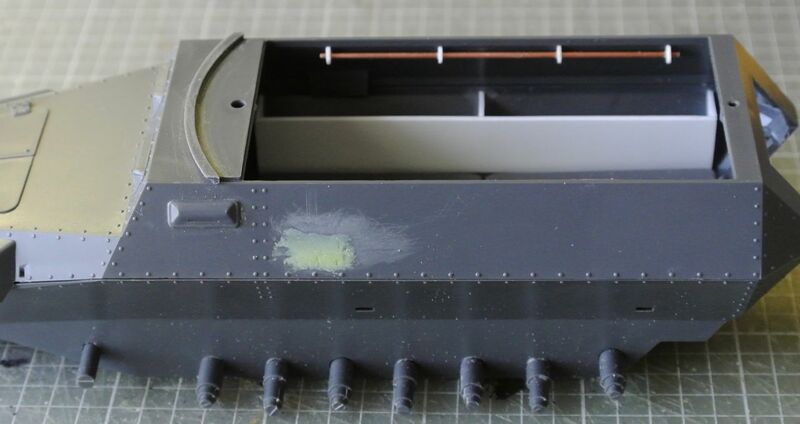 The tank has just been glued together. 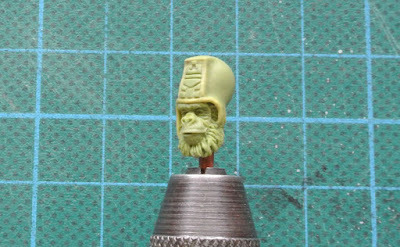 The interior faces of the armour plates were each painted and weathered before being brought together. 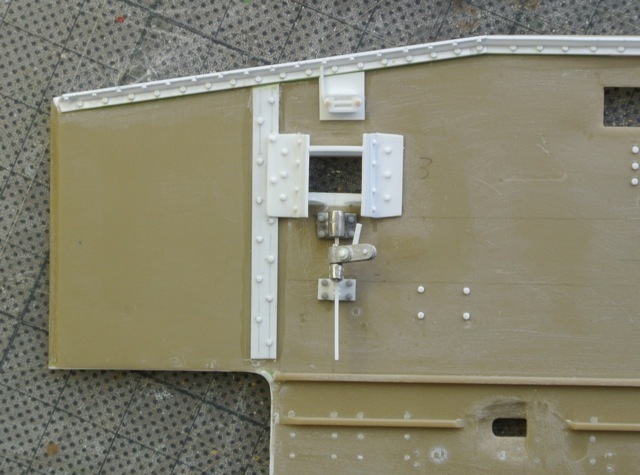 Bare plastic in each corner (here visible in the rear right corner) would be covered with bolted framework. 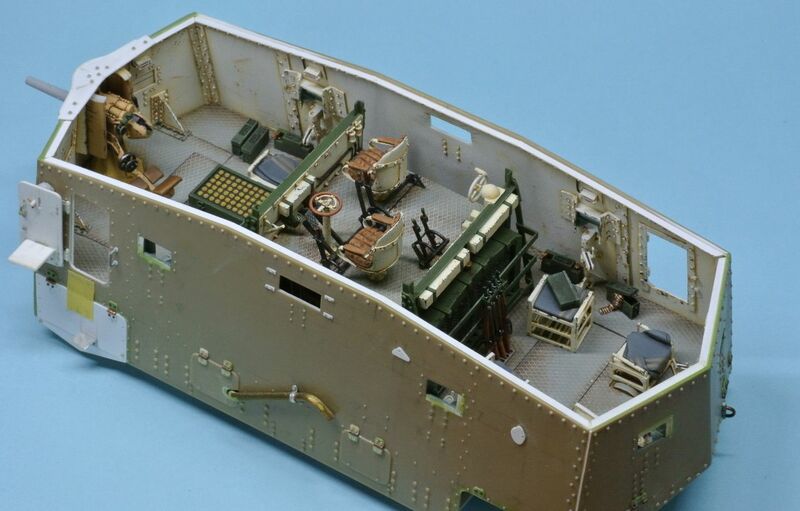 Exterior detailing will be covered in a future post, but here can be seen the interior of the A7V cupola. 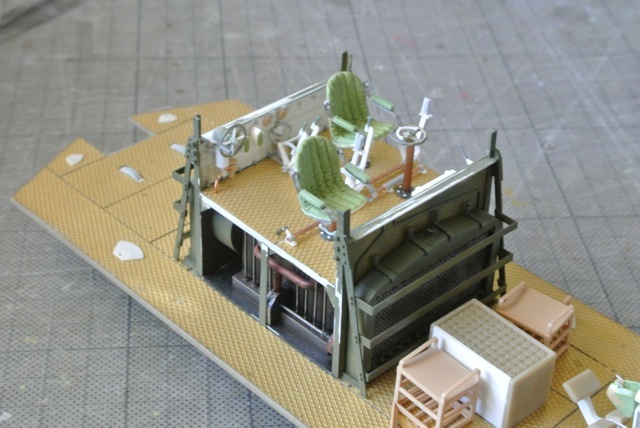 This is all built from scratch, with stacks of punched-out bolts for detail. 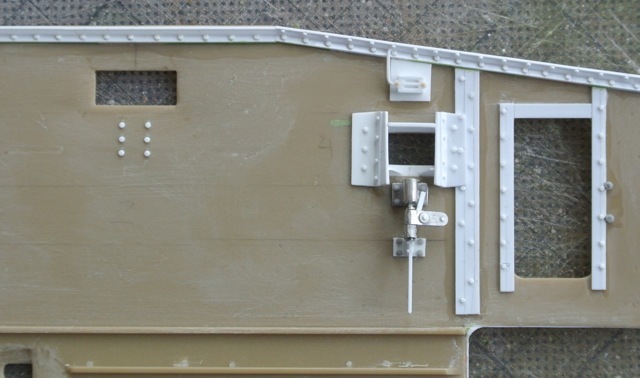 The compass in the roof was built from some plastic scrap and was based on the one in the Meng model. I went a little nuts and added the cardinal points using the tiny labels from decal sheets. 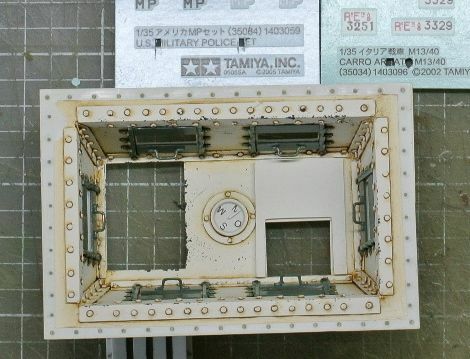 The letters are still probably oversize but I don't think the compass will be visible once the model is assembled. 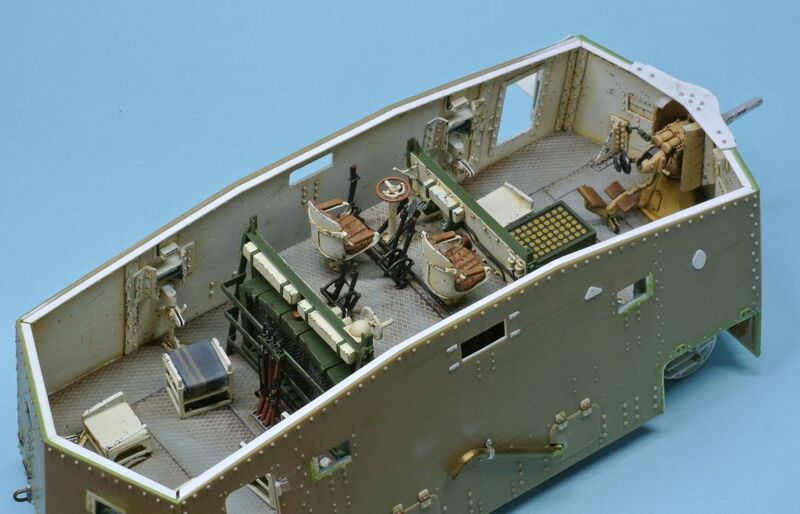 The model will depict vehicle 563 'Wotan' during summer exercises in 1918. 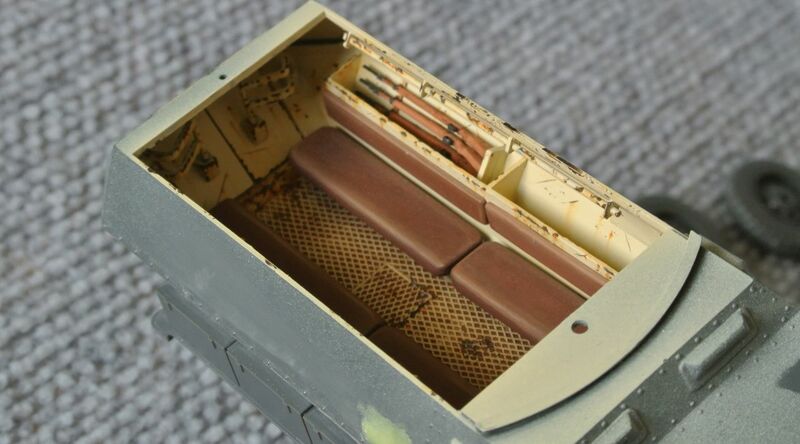 The tank had seen limited combat, so while I wanted the weathering to be visible I didn't want the interior to be filled with dirt and grime. 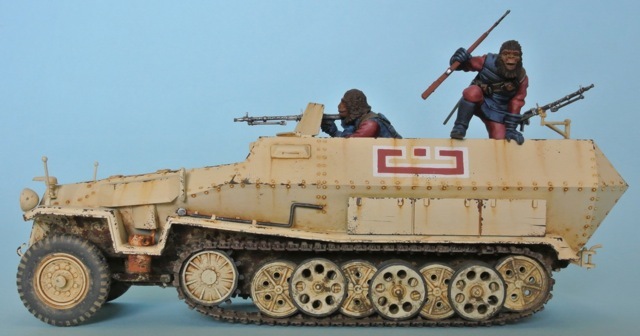 Great War tanks were notoriously noxious places to work, so it's very possible that even a relatively new vehicle could be quite dirty, but this is where I've settled. I may add a toolbox and maybe a broom, but we'll see.